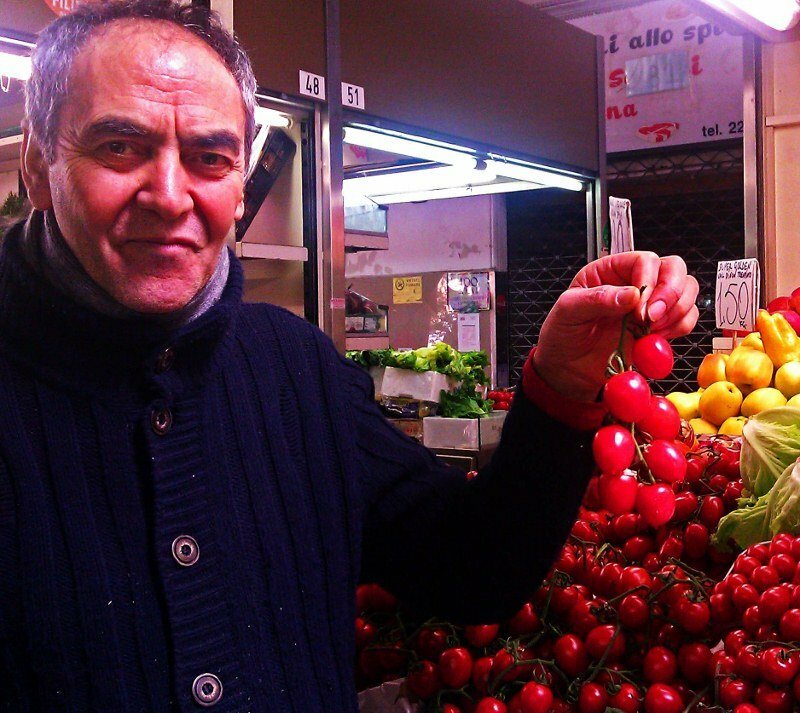 In our humble opinion Italy serves up the best food in the world, a belief that is shared by millions. 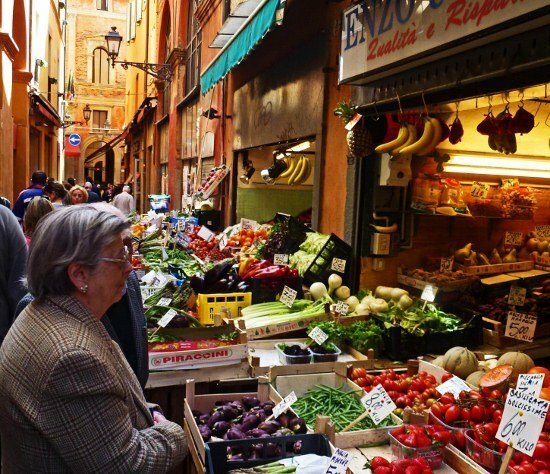 Since the northern Italian city of Bologna is the food capital of Italy it is a must-visit spot for any foodie. While we were enticed by the Bologna food we also fell in love with the rhythms of the city displayed on the streets and sidewalks. 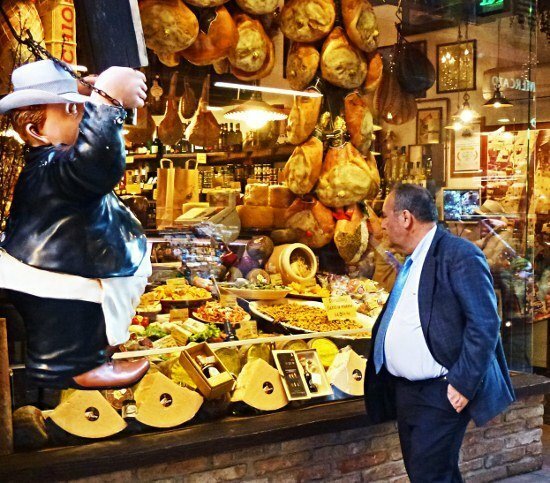 Here are some photos from a day walking, and eating, around Bologna. 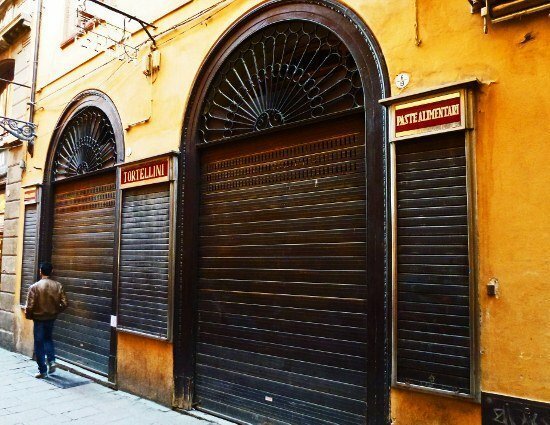 The Atti market on the Via Drapperie, which as been in the same family for five generations, was closed when we showed up. Not to worry, we’d come back. Here’s the same market a few hours later bristling with local Bolognese-made products. Can you spot any similarities between the customer peering in the shop window and the figure on the left? Besides the blue jacket of course. 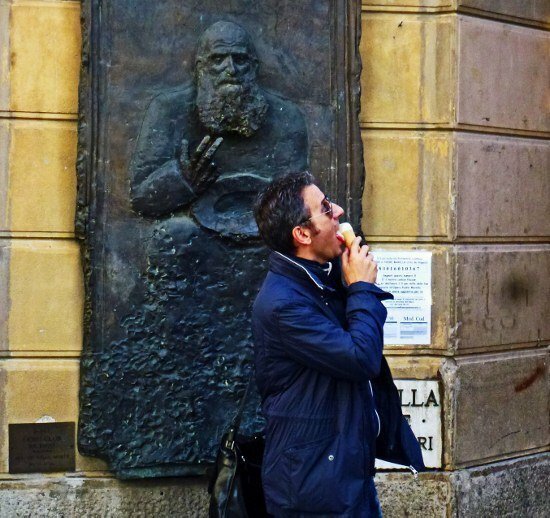 A man enjoys his gelato in front of a plaque dedicated to Father Marella, unaware of the imploring gesture from the priest who dedicated his life to raising money for the poor. 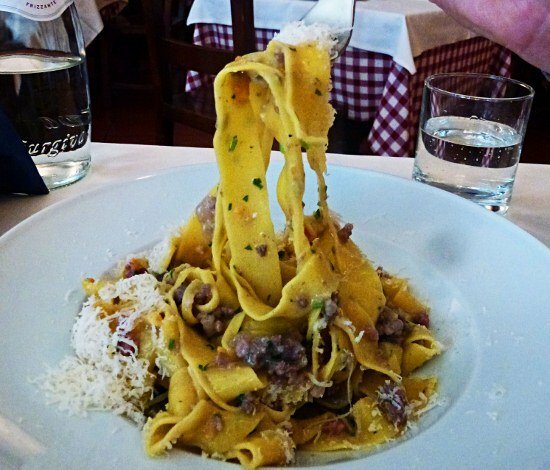 A local specialty of Pappardelle with Ragu Bianco, a meat sauce without tomatoes, served up at the Taverna dei Lords. It didn’t occur to us until we put this post together that the above sign was in English, not Italian. 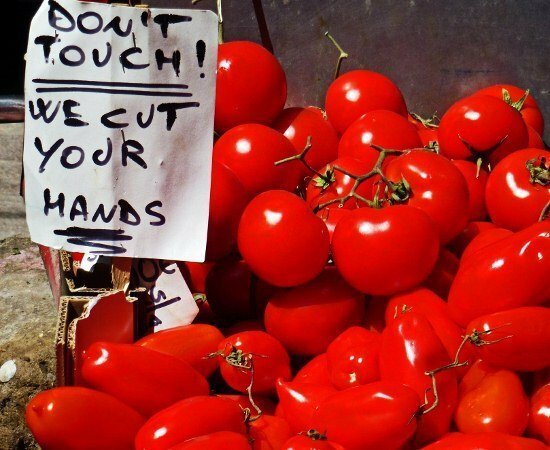 There’s a reason for that.We learned the hard way a few years back that in Italy, as in much of Europe, the customer doesn’t squeeze the produce for ripeness. Instead they rely on the vendor to give them the best product available. 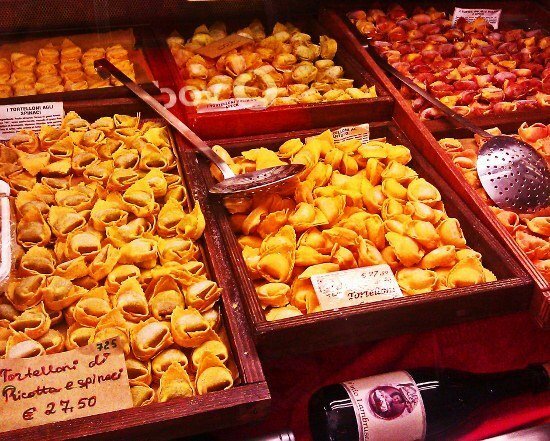 One of the local culinary treats is tortelloni, served with a variety of fillings. 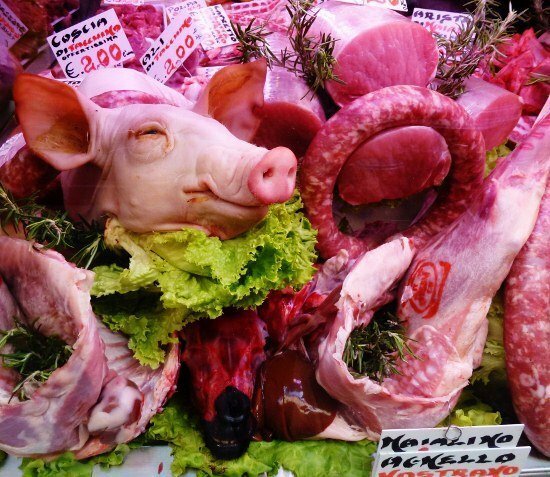 The butcher shops are a bit more graphic than we see at home but they certainly show that the meat is fresh. 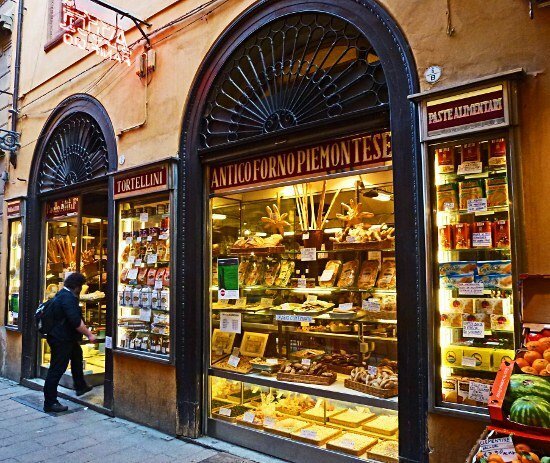 Working your way through the narrow streets of the medieval-era market just east of the Piazza Maggiore is part of the fun of food shopping in Bologna. 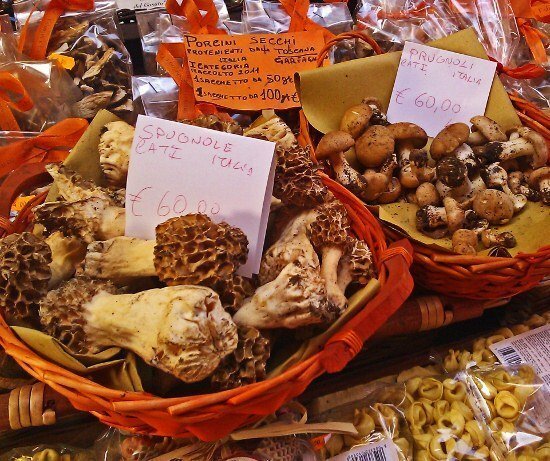 When your favorite mushrooms are in season, grab ’em! 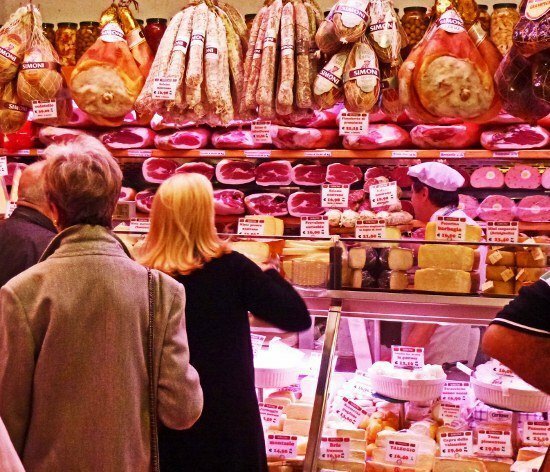 Bologna is the capital of the Emilia Romagna region, a culinary smorgasbord famous for being the birthplace of Parmigianno Reggiano cheese, prosciutto de Parma, ragu Bolognese, tortellini, balsamic vinegar de Modena, mortadella and Lambrusco sparkling wine. No wonder shopping at the markets is a head-spinning experience. 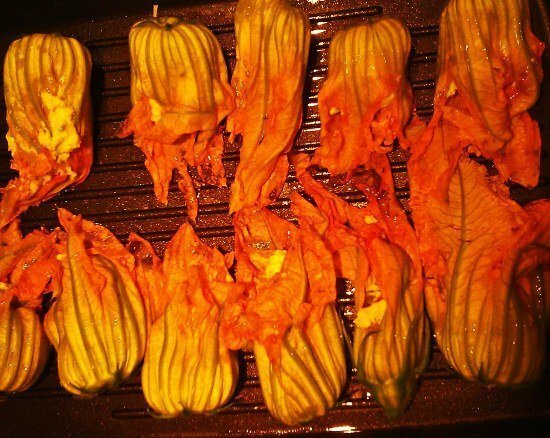 Larissa was so inspired by the markets that she whipped up a serving of roasted stuffed zucchini flowers. They were delicious. 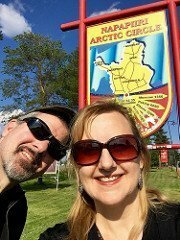 Read about her learning how to make pasta in Italy. 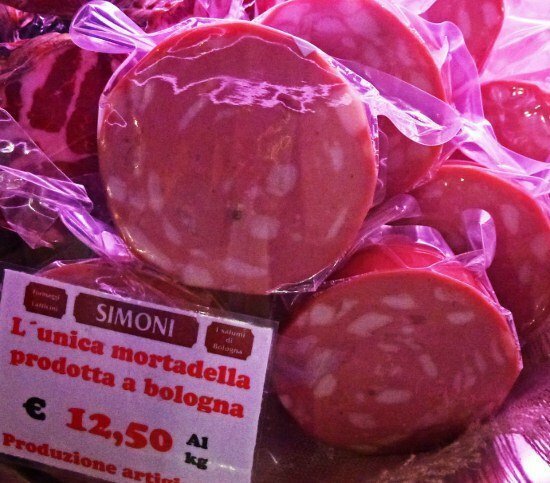 No food tour of Bologna would be complete without trying mortadella, the meat that is the godfather of baloney.